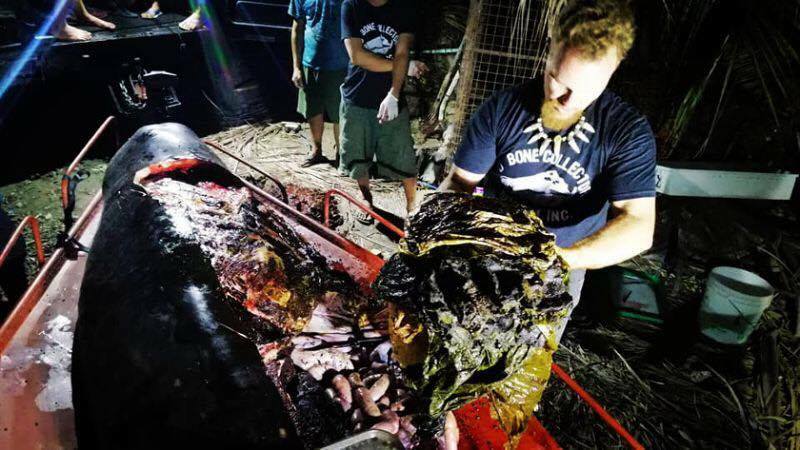 A dead whale has been found in the Philippines with 40 kilograms of plastic in its stomach. The carcass was pulled from the ocean on Friday 16 March 2019 with scientists identifying the cause of death as starvation and dehydration due to plastic. “This whale had the most plastic we have ever seen in a whale, it’s disgusting” reported D’ Bone Collector Museum Inc. President and Founder of D’ Bone Collector Museum, Darrell Blatchley and his team were called to retrieve the carcass, transport to their facility and perform the necropsy, 9 News reported. 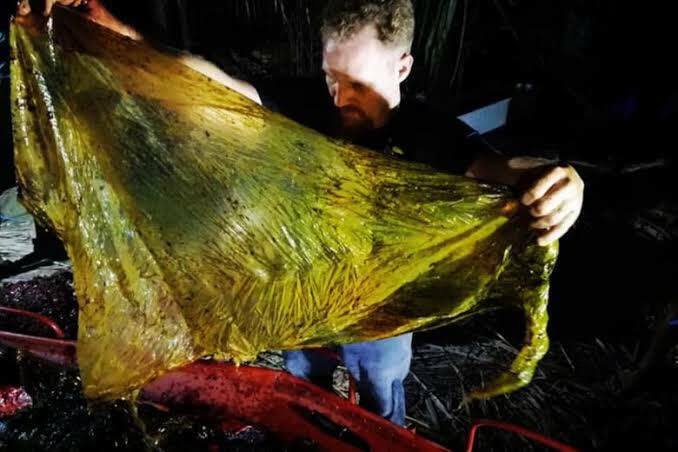 The 40 kilograms of plastic content pulled from the stomach of the juvenile male Curvier’s beaked whale consisted of plastic bags, rice sacks and shopping bags. Image Credit: D’ Bone Collector Museum Inc.
“The death of this whale is profoundly disturbing and it brings into question our own morality” said marine ecologist and Take 3 Co-Founder, Roberta Dixon-Valk. “If we continue to use single-use plastic for the sake of our own convenience, we will continue to affect the lives of precious marine wildlife. We need to clean up our act and this planet that we and so many other species call home” said Dixon-Valk. How can plastic be eaten by animals and why is it harmful? Like many other whale species, Curvier’s beaked whales use echolocation (using sound to identify and locate objects) to hunt. Curvier’s beaked whales travel to depths of three kilometres or more to feed. Down there, the ocean is pitch black and echolocation is essential to identify food sources. “This is the problem” said Dr Natacha Aguilar de Soto when interviewed by Sky News, their natural food source has “an echo very similar to plastic bags.” Dr Aguilar de Soto is from the University of La Laguna in the Canary Islands with over a decade of experience in studying beaked whales. Not only can plastic sound like food, at shallower depths it can look and smell strikingly similar to an animal’s natural food source. National Geographic have reported that 700 different marine species have been identified thus far, to have ingested plastic. For example, when a plastic bag floats in the ocean it moves and bobs with the current like a jellyfish, making ingesting plastic an easy mistake. Similarly, many marine animals use scent to decipher whether something is food or not. If plastic is covered in alaege, it would appear as food, which leads to starvation as the animal is unaware that they’re filling their stomach with plastics instead of nutrients. When an animal eats plastic its chances of survival go down immediately. When ingested, plastic can compact in the stomach, stopping the ability of real food to enter the animal’s intestines. When plastic lines the stomach, it inhibits nutrient absorption and can contribute to fatality. “It’s up to every single person to be the difference and say NO to single-use plastics” said Dixon-Valk.